We launched the corporate website at www.anniesearle.com in July of 2009. We did reorganize the content somewhat in 2010, but have in general stuck to simply adding new content to the existing structure since then. 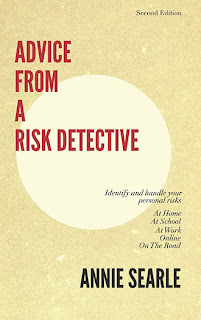 With the publication of Advice From A Risk Detective in 2011, we launched this blog rather than focus on the website. So it's no surprise that when ASA research associate Lauren Du Graf came back this summer for a few weeks before she took up summer work in Berlin, we recruited her to take a hard look at the site and recommend improvements. She researched other sites, listened carefully to the types of work we were now doing, and then recommended an overhaul that is now mostly complete. Taking a next generation website live is always a nail-biter, especially when you already have a live site that gets a good website rating from Google, and when you are deleting or moving around a great deal of existing content. We really could not cut over to the new site until we had fixed all links so that they pointed to the new locations on the website. If you take a look now, you'll see a navigation bar across the top of the page that better reflects how the company has evolved, including a section on books we've published, and information on the types of public speaking that we do. You'll also find a search function on the site, as well as a "subscribe for free" button that allows you to see at a glance the types of content we generate, including this blog. There are a few other changes still coming, with more photographs and video that Lauren is in the process of editing. And we're still rewriting some of the content on the site. Because the navigation is so revised, I am comfortable calling this our next generation website. Please let us know what you think.